At Flōte Hampton, we offer a wide range of classes to help you relax, strengthen and activate energy in your life, using yoga, meditation and more. We designed these to complement your own practice of self care and awareness. This class offers an introduction to mindfulness meditation. Learn how mindfulness works in the mind and the body. Develop strategies that help calm the chaos of a busy lifestyle, improve concentration, and foster healthy relationships. Join Joy and Lisa for a guided meditation accompanied by the soothing sounds of gongs and bowls. The frequency of the notes can help shift you into a deeper, more relaxed state. With breath, sound and intention, this could become your favorite way to meditate! A dynamic yoga/dance class to activate and awaken the Shakti within all of us. Shakti Flow focuses on spiral and primal movements honoring the Divine goddess of creation, dynamic flow, and empowerment. This all levels custom class is known to boost confidence, activate feminine energy, and make you feel fantastic. Kundalini Yoga as taught by Yogi Bhajan is a dynamic class designed for the busy yogi who needs to recharge and rejuvenate their body, mind, and energy field. The constant barrage of negativity we all face clogs our very essence, and Kundalini is an immediate way to not only clear that negativity, but fill ourselves up with beautiful crystal clear light waves of happiness. Each class consists of a prescribed Kriya (complete action), relaxation and meditation. We utilize sustained movements of the body to circulate prana (life force energy) and change the stuck energy patterns in the body. A different experience, appropriate for all levels of practitioners—beginners are always welcome! Traditional Kundalini apparel (all white) welcomed, though certainly not required. Come prepared to move, chant, laugh and have direct experience that is like no other. Can’t find the time for yoga? Join us for a 45 minute express class. Slow flow, vinyasa and built for your busy schedule. All levels encouraged and welcomed. Yin Yoga stretches and targets both deep connective tissues between the muscles and the fascia throughout the body with 2-7 minute mellow holds. The aim is to increase circulation in the joints and improve flexibility and mind clarity overall. Mandalas, triangles, circles—have you ever wanted to learn more about the meanings behind these sacred shapes? This class is an all-levels flow, focused on visualization and embodiment of these sacred shapes to guide you deeper into self inquiry and manifestation. Breathwork, asana and repetition act as sacred portals into the subtle realms. No experience with mathematics needed. This class offers a unique experience where breath and body movement flow in sync, bringing a mindful inner focus of the body while it is in releasing and/or receiving mode. The class allows for students to feel comfortable with moving Qi to help activate the body’s energy meridian channels. It is very common for individuals to participate in Qigong practices to support healing, and most importantly to prevent diseases. But many individuals enjoy the exercise practice because it is a gentle flowing practice, invigorating, and all tremendously peaceful at the same time. All levels total body stretch. A full body stretch using movements that flow smoothly to increase flexibility, decrease muscle tension, develop core strength, and improve muscular balance. Requests for targeted areas will gladly be taken into consideration. Join Certified EFT Practitioner, Tricia Lavalley, for a fun, fast-paced experiential 45 minute workshop to learn EFT/Tapping. Tricia will teach you tapping basics, the tapping points, answer your questions and take you through a specific exercise so you can feel the power of The Emotional Freedom Technique. Our workshops are an extension of who we are and what we want to share with our community. We are pleased to bring events to the Seacoast that uplift, educate and inspire. New moons represent beginnings. This workshop is an opportunity to set intention, connect and manifest. Join Dr. Margaux French and Catherine Markovsky on the new moon for a night of sharing, meditation and sound healing. Bring your intentions, a yoga mat and blanket. The full moon is an excellent time to get rid of that which no longer serves us. Join us as we let it go and reset. Experience a guided meditation, leading you in breath and mantra, as you release the old, tired patterns and allow new fresh energy to emerge in your life. 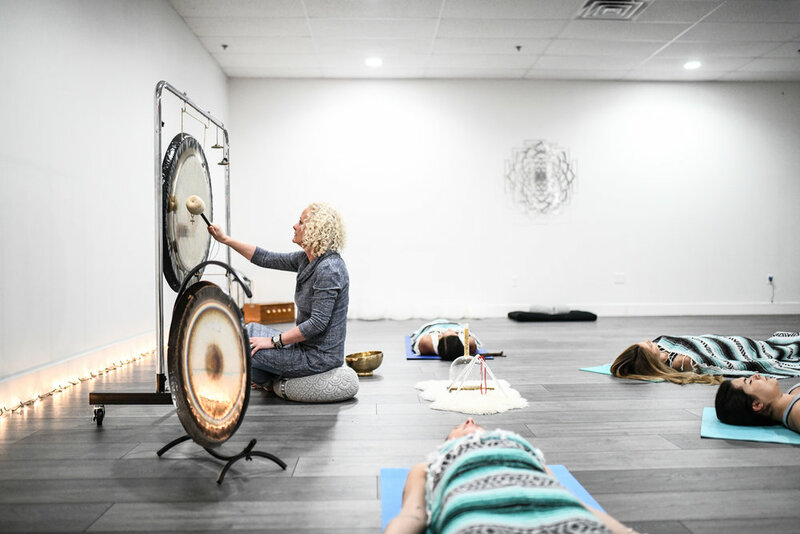 Following the meditation, you’ll be immersed in a sound healing experience that will expose you to subtle sound vibrations that shift your awareness and state of being, allowing your body to heal itself from the inside out. You don't need to have any experience to attend, we will guide you. Participants can lie down so dress comfortably and bring whatever will make you comfortable, a yoga mat, pillow, blanket, and water bottle. Favorite Essential Oil: dōTERRA Anchor. It’s part of their awesome yoga collection and smells AMAZING. Favorite Crystal: Rose quartz because the gorgeous pink color just exudes love! Bucket List: See the northern lights. Favorite Crystal: Moonstone. It calls upon the current energy of the moon so the energy shifts with this stone often. Bucket List: I’ve had dreams of swimming with whales for years now, and I would love to freedive with whale sharks someday. I swam with wild dolphins when I lived in Hawaii and it was one of my most memorable experiences connecting with nature and brilliant beings—it became a monthly full moon meditation as they would come into the bay I was living in every full moon morning to rest. Favorite Essential Oil: Sage. My whole space feels clean fresh clear. Favorite Dish & Restaurant: I love lobster any way! I like to go to big Al’s because they have fresh bread, but I will eat it anywhere. Bucket List: For everyone in the world to accept each other as one pure love. Favorite Crystal: Do I have to pick one!?! I always love selenite. It keeps a space so fresh and clear. I always have some in our most used spaces at home. At the moment I am also loving citrine. It manifests joy and abundance. Most people focus on using it to bring success and an abundance of finances but I'm using it to bring abundance to all aspects of my life! Favorite Restaurant & Dish: Blue Moon Evolution—I love everything they create. They have local food that I can feel really good about eating. Favorite Quote: "Let food be thy medicine and medicine be thy food"-Hippocrates Most people have forgotten what it is like to eat real unprocessed food and truly feel healthy. When we consume real food there is little need for medicine, somewhere in present history we forgot this. Bucket List: I want to go to Ireland! I have no idea why but I am really drawn to the Cliff of Moher. My family is originally from Ireland so maybe I'm being called back to my roots! ?